I don’t make New Year resolutions, have never made. I found the concept too dilute to take it seriously. However, I do plan for the year and for some bizarre reason, I don’t see New Year resolutions and my plan as the same. I think its something got to do with the conceptualization. I take my planning seriously, yet I don’t achieve 60-70% of it by the end of the year! As I said, it’s the planning that I take seriously, implementation goes for a toss midway! While achieving 30-40% of my plan does not sound like a World Cup win, I can coax myself into believing I did. And why not – every single minute of those 40% has witnessed the best in me. We all should bring out the best in us, if we have to achieve substantial results. I have a few acquaintances who have had resolutions running like local shopping mall receipts – long! At the end of the year, the same lists are carried over to the next year with renewed vigor! This begins to become so routine that they tend to forget the real intention behind a resolution – To become Resolute, self confident, to improve! 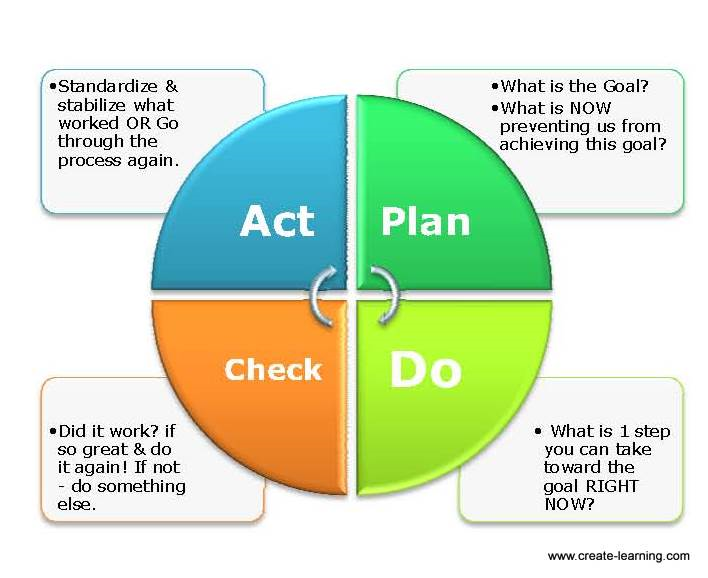 It is a tool to get closer to the Plan-Do-Check-Act cycle, to utilize the power of PDCA to maximum effect. You could say that my friends are following the PDCA cycle every year – they plan for a better year, do nothing about the plan, check whether all the plans are still there, and act to carry them forward to the next year with renewed vigor! But hey, would you like to subscribe to them? I have only one thing to say, two actually. One – If you ARE making resolutions, write them down and display them in front of you all year around. Maybe in the office dashboard, at home at the door of your closet or your bedroom door. TWO – swear to yourself, you would bend all bones (of your body!) to strive to achieve them. Document achievements and failures alike and at the end of it, review their effectiveness. Sounds difficult? Actually it is. But without trying, you cannot even say it’s difficult, can you? Now go get a pen and paper to do some serious resolutions, while I go for a resolute cup of Cappuccino!